Outsiders coming to Kutch got fascinated with these extraordinary hand worked items and would want to get some of these items for themselves. They started making offers to buy them. Some of the communities started selling the work, as they needed the money to cope up with the living pressures due to droughts and their restricted mobility. The Govt. 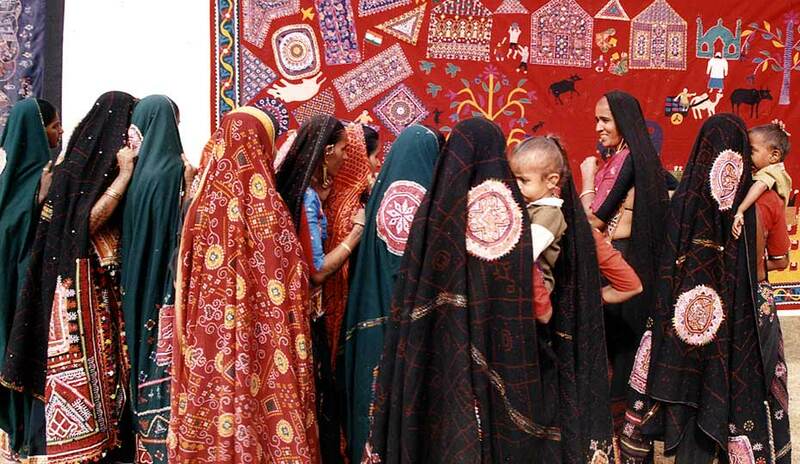 of Gujarat set up a Corporation for the development of Handicrafts in the State who set up selling outlets in big cities of Indiaand organized procurement of craftwork from the interior regions of Kutch. In years of droughts special purchases were made to provide relief to many of these communities living in the arid interiors. With a sudden boom the focus was more on quantity than on quality, which led to quick and mass production. This period also saw the birth and growth of 3 to 4 development organizations in the region that started actively working on the ground for the development of embroidery craft and create income generation opportunities for a few thousand of the thousands of embroidery craftswomen inKutch. Their focused approach and a vision for preservation & development brought stability for the artisans under their fold. While the Corporation found it easier to work with handicrafts such as block prints, weaves, tie & dye, leather, bell making, lacquer work etc. which were primary source of income for its artisans, they found it difficult after some time to manage the procurement & production of embroidery craft. The Corporation wanted to know about the ground realities and requested a Development Support Organisation to help them in this process. This led to the formation of KMVS, which was started by a group of young women in collaboration with rural women ofKutch, sponsored by the Gujarat State Handicraft Development Corporation, Gujarat Women & Child Development Corporation & Jan Vikas, Ahmedabad. The founders of KMVS wanted to look at not just the craft aspect as an income generation programme, but to work for the socio-economic empowerment and development of rural women in these interior areas of Kutch District with a holistic approach. The artisan members were organized to re-look at their craft skill and building their capacities for working as artisan-entrepreneurs and not lowly paid piece rate workers. The larger collective of KMVS worked on the other issues concerning the lives of its rural members and started programmes for health, education, environment, legal and self-government issues. This process lasted for a few years and again the women were at cross roads for developing this new found opportunity of working with embroidery craft as a livelihood option for secondary income to support their families. 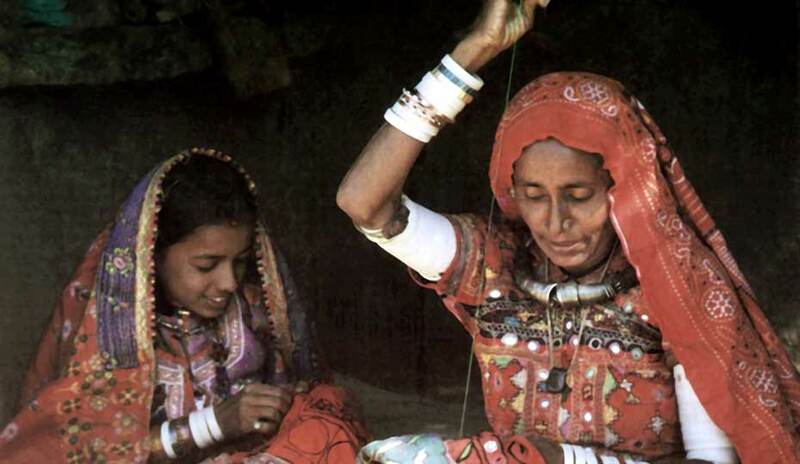 By 1996, KMVS had to re-think about the craft activity as orders to the women from Gujarat State Handicraft Development Corporation had also reduced considerably and had almost come to a stand still. A market system had to be created which would not be dependent on one source as the Corporation (who till then had given a major support and had become the main market avenue).